RTH hasn't published much about the peak oil hypothesis recently; not because we've given up on the theory, but because not much has happened recently to cause us to revise our assessment of the situation. After two decades of almost continuous growth, global oil production has been stagnant around 84 million barrels a day for the past two years. This, of course, is exactly consistent with the peak oil hypothesis, which predicts that supply constraints will force up prices, destroying growth in demand. It will be some years before we can tell for certain, but it is entirely possible that we're in the middle of peak oil right now. That's certainly consistent with the predictions of Kenneth Deffeyes, Colin Campbell, Matthew Simmons, and other geologists and oil industry analysts. This hasn't stopped the peak oil deniers from continuing to press their suit. Vaclav Smil, an instructor at the University of Manitoba, recently wrote an article for TCS Daily, a right-wing web magazine, that manages to obfuscate mightily on the matter. He crowed about the fact that oil prices dropped from over $70 a barrel in July 2006 to $55 in December. As I write this, Bloomberg reports that futures are trading for $61 a barrel. He also took Saudi Aramco at its word that it can increase production to 11 million BPD by 2011, even though the company already admitted that it cannot entirely offset declines in its Ghawar oilfield. Flat production is flat production. Despite the very high prices and widespread demand destruction, especially in poorer countries, oil producers have not brought more supply on-stream. That's just bizarre, unless the oil producers can't bring more supply on-stream. Some of the biggest producers - Saudi Arabia, Mexico, and the North Sea - are past their production peaks and declining inexorably. The smaller producers can barely replace those declines, let alone produce a net increase. Are we really to believe that OPEC simply cut their production because they like pricing their customers out of the market? Only time will tell if production will increase. Bad news seems to encroach on production increases: Canterell crashing faster than thought, rumours about Ghawar, The North Sea, Iraq, Iran, Khazakstan (spelling?) delayed, the list is endless and production static. The oil age has already ended for many of the poorer people in the world as they drop out of the price contest. More and more people will drop out and production will drift sideways at first and then imperceptably down. Even then CERA will be in denial ansd life will go on much as normal in the richer countries. It is only when the US, EU, China and India are bidding against each other that things will get tough for the rich world. By then it will be way too late..
An important point (not mentioned but not to be missed) is the fact that OPEC (prior to the addition of Angola) also showed declines in production when prices were high in early 2006. Although it took several months for the production data to become clearer, the inability to meet the demand started showing up in the prices. The other thing that gets hidden by some of the data is the amount of Natural Gas Plant Liquids (NGPLs or NGLs) that are 'inlcuded' in the production numbers as well as 'other liquids.' And there can be a certain amount of double counting...production of oil, some used for production of 'liquids' does not mean that the sum of both is the total production. in the past, this degree of minor double counting was pretty minor, but as other liquids must be produced to offset production declines, the total liquids numbers can be a bit of an illusion. 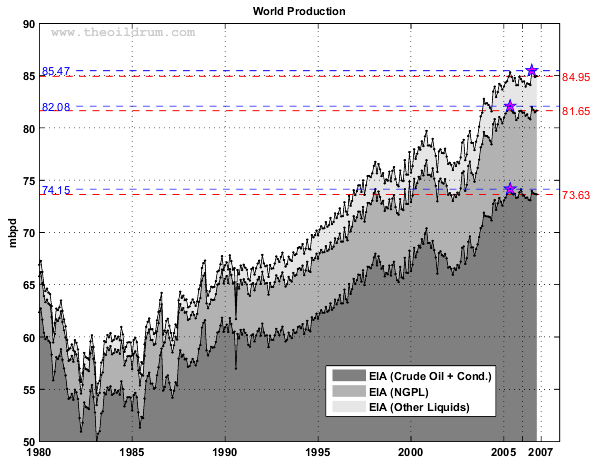 The Nov. 2006 EIA monthly numbers show that 06 crude and concentrate world production is down around 160,000 b/d. we know that KSA is down in Dec. yoy. Add The North Sea, Norway and the UK and we can estimate down 700,000 b/d. Mexico has reported being down over 400,000 b/d yoy. Dec 05 was a big month and IMO Dec 06 will be at least 800,000 b/d below Dec 05. Thus for the calendar year 06 will be about 200,000 b/d less than 05 IMO. Iraqi declines in Jan 07 to 1.1 m/b/d from 1.6 in 06 plus a continuation of the above allows a credible estimate of Jan 07 being down over 1 m/b/d from 06. The official report is always two months after the fact. So far, the EIA data shows the peak of crude on a monthly basis as May 05. I've been following video links about peak oil from you tube and google video. It seems the average number of hits is about 30000. In the end we are really shouting into the wind. Addendum to my 2/27 post above: December EIA numbers were released. December production was down 733,000 b/d and 06 numbers now stand as down 193,000 b/d over 2005. My January estimate is still valid. the data still shows the crude peak as 2005 on a yearly basis and May 05 as the peak month. There is a thread on TOD today that shows KSA down on a 8% decline in 2006. That hole peak oil hypothesis is just pure speculation. Even though the EIA has conservative values concerning the oil inventories around the world, they are still not accurate. They change depending on the sources we get the info from. The world's has not tapped into all the oil resources. OPEC represents only 40% of the oil production in the world. Therefor, there opinion is still valuable in determining the oil futures??? There is surely something wrong with that! Oil nowadays can be found in large amounts in oil sands. They are barely tapped considering the huge reserves in the Canadian oil sands. Solvability is not great at the moment so production and exploration has been put to a hold. Therefore putting a halt to the increase of production. This winter has been quite warm due to global warming and consumption, lower than before. American reserves were at a unusual 11% higher than the years before. 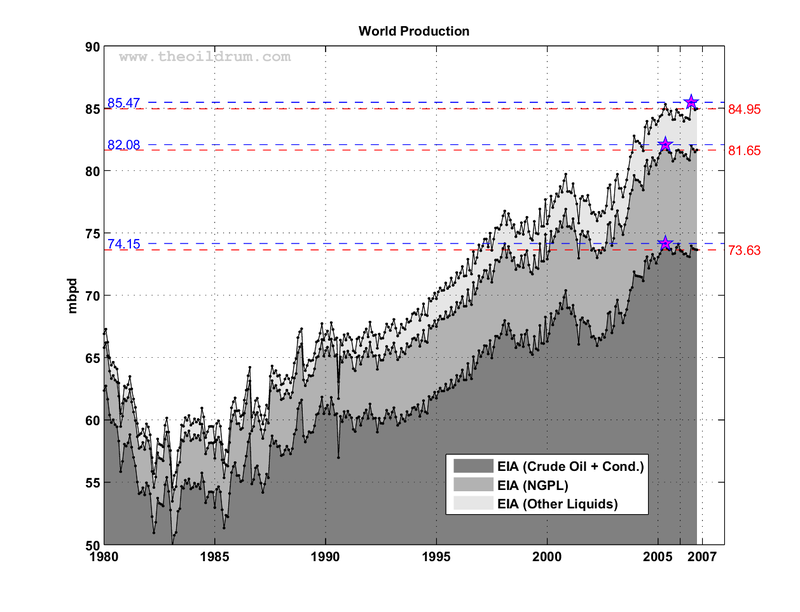 So by simple logic it is impossible that we have reached a peak in the production of oil. So in conclusion there is still plenty of oil left and the sector will be underperforming this year. Feb. 07 EIA numbers show the first 2 months of 07 down 447,000 barrels from 06. Gasoline is going through the roof and Brent hit $70. OPEC won't consider any increase until Sept.07. KSA is down 900,000 b/d in Feb. The peak of light sweet is affecting refiners and the price of gas. OIL sands are not a fix as the costs are rising exponentially and water is a limitation. They are good investments but are limited by scale and time to scale. That's 447,000 barrels a day or 2,682,000 barrels less than the first two months in 06.